It has been a long while since I have actually used my camera, it has been a while since i have done anything i consider remotely creative. It’s things like this (Make something cool everyday) that make me feel so bad about myself and the fact that I am uninspired because I simply don’t do anything. It is true what they say, that creativity is a muscle and if you leave it, it will leave you. i will be starting my own create something awesome every day … today! I will be posting before the end of the day the location and my first work. With moving house, melodious.me, The One Off and a hundred other things to do I really need to find a way to have more active hours within the day. I wake up at 6:00a.m. and work on Melodious Me till 7:30ish I get breakfast and then off to the office, when I come back I want to work more but I feel drain and tired – I look at the screen and it makes no sense. I need to radically change the way I do things, and I know that exercising would help but there is simply not enough hours in a day! BAAAAHHH! I don’t know what to do. I really hope that our new house will bring some serenity back to my life – and that it will help me out establish some more healthy habits. My sweet Janet helps so much with that. I don’t know what I would have done without here. I would have possibly been 300kilos coughing my lungs out and sitting like a blob in the middle of nowhere! Aaaaanyway! This was a bit therapeutic! Did you ever had to face the same or relevant issues? And how did you manage to get unstuck and go on? 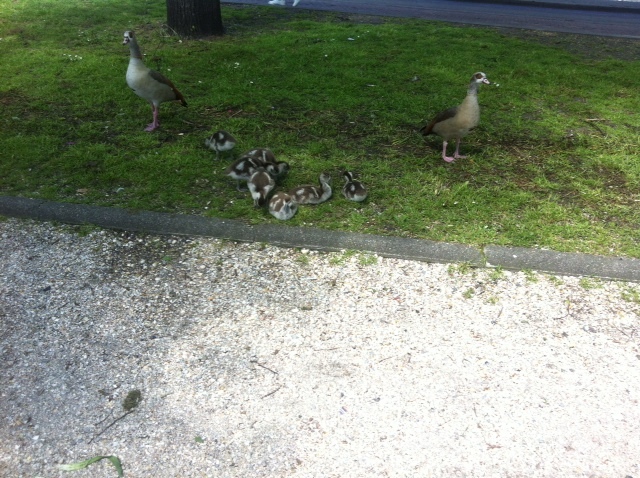 And as promised … duckies! These two were two very protective parents!